In August 2017, Mazda joined the likes of Aston Martin, Ferrari, and Porsche in offering a restoration program for their iconic models. Naturally, the first model to benefit from this is the first-generation Roadster (aka MX-5 or Miata). 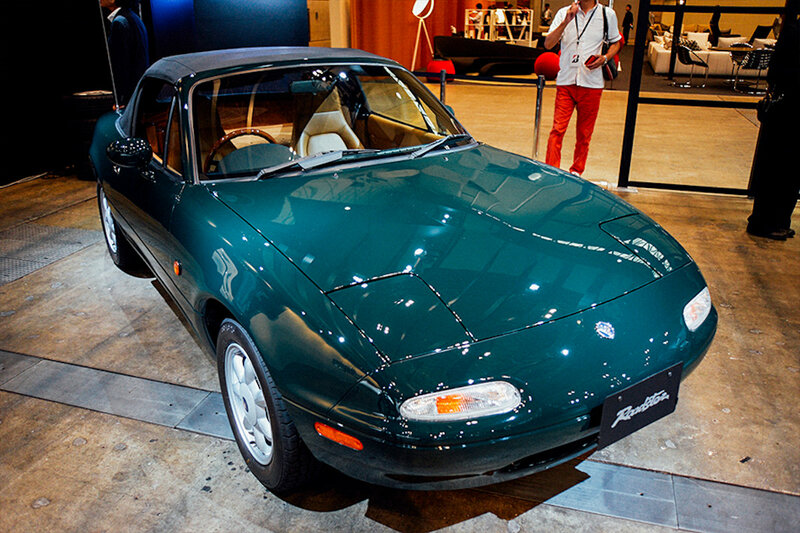 The first recipient of this ground-up restoration is this 115-horsepower 1990 Eunos V-Special Type I finished in British Racing Green with a black top and a tan interior. It showcases all the parts that Mazda has started reproducing for the first-generation “NA” roadster including the wooden NARDI steering wheel and shift knob, vinyl fabric roof, and even the 14-inch Bridgestone SF325 tires. Takahiro Kobayakawa or Koby-san from Mazda’s Brand Strategy Department in charge of Global Sales and Marketing says that Mazda takes this Restoration Garage program very seriously. He says that these cars are worked on in a TÜV Rheinland Japan Co., Ltd-certified classic car garage and because of the level of detail involved (the cars are stripped down part by part, down to the nuts and bolts), only 1 or 2 cars are accepted by the Restoration Garage program per month. Because of that, Koby-san says that Mazda technicians actually go to each applicant’s house to check the condition of his or her roadster. From there, they determine the amount of work needed, or if they can actually proceed with the restoration at all. While the Restoration Garage program is currently limited to Japan only, Koby-san says he’s working closely with Bermaz Auto Philippines, the exclusive distributor of Mazda in the country to give MX-5 owners here access to the reproduced parts. Soon, first-generation MX-5 owners in the country will be able to order and purchase parts such as the vinyl roof from their authorized Mazda dealer. With the MX-5 celebrating its 30th anniversary next year, the announcement of the parts availability for the first-generation model sounds like great news to keep the passion alive for these enthusiasts. How about your current Skyactiv car parts? It takes around a month for parts to arrive from Japan. It would be nice if they have a parts storage warehouse here, to avoid that one month wait period. Current parts are available and Mazda Philippines does have a parts warehouse. As you may know, recent typhoons and flooding in Hiroshima and Kansai have affected availability and delivery of certain parts. We're trying to catch up on parts delivery timing.